A delicious rice cake snack made from glutinous rice, lihia or lye water, salt and wrap in banana leaves. Then boiled until the rice is done. 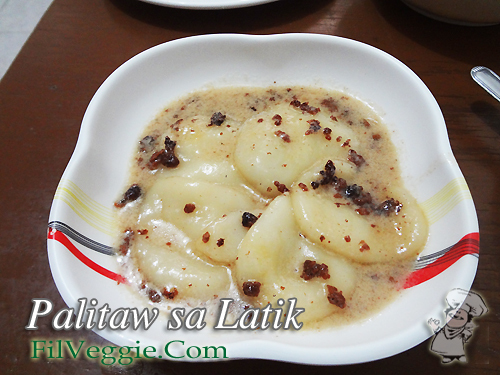 The sauce is made from cooked coconut milk with brown sugar that resembles a saucy coconut jam also called latik. It is not hard to cook as you think. The only hard part is wrapping the malagkit rice in banana leaves and tying them in pairs before cooking. Soak malagkit rice in water for 2 to 3 hours. Drain. Mix malagkit rice, lihia and rock salt together. 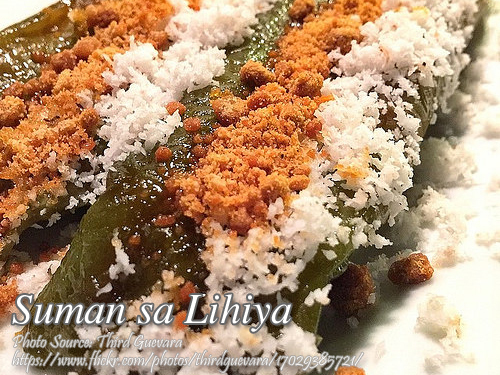 Wrap them in banana leaves into shape of squarish suman very carefully. Bundle them in pairs and arrange in a pot or casserole. Put water about level of suman and cook over low fire. Extract milk from shredded coconut. Strain. Set aside shredded coconut meat for topping. Cook coconut milk with panutsa or brown sugar until mixture becomes thick. Toast shredded coconut meat in pan until almost dry. Add brown sugar and continue toasting until done. Serve suman with fine white sugar or sauce.